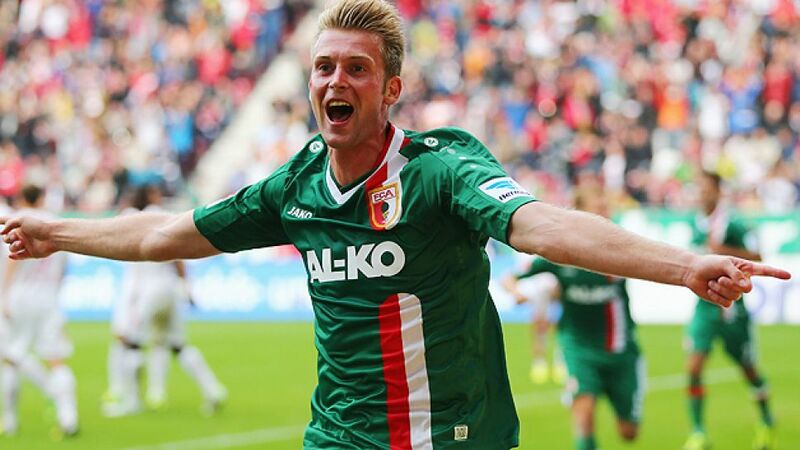 Augsburg - FC Augsburg claimed their first points of the season with a 2-1 win over VfB Stuttgart, condemning their opponents to a third straight league defeat in the process. Halil Altintop opened the scoring for the home side with an early tap-in, before Jan-Ingwer Callsen-Bracker’s header doubled the hosts’ advantage. Vedad Ibisevic halved the deficit from the spot, but Augsburg held on with a resolute second-half display, aided by a red card shown to VfB’s Ibrahima Traore. In the second game on Sunday where the opposing sides had gone into the encounter without a point, it was Augsburg that began on the front foot. Raphael Holzhauser, on loan from VfB, tested Sven Ulreich in only the second minute, before the opening goal arrived almost immediately afterwards. Paul Verhaegh was given time to measure a cross that evaded the Stuttgart defence, leaving Altintop with the simplest of tasks to make it 1-0. Stuttgart looked like they were feeling the effects of Thursday’s exertions in the UEFA Europa League and their play was littered with errors, both with and without the ball. Their front two - Vedad Ibisevic and Mohammed Abdellaoue - were starved of service in the opening stages, and Abdellaoue cut an especially frustrated figure when he was booked for a rash challenge on Verhaegh. A curling shot from Hiroki Sakai was all that the guests could muster going forward, and their carelessness at the back soon had them two goals behind. Konstantin Rausch conceded a cheap foul on the wing and from Holzhauser’s wicked delivery, Callsen-Bracker nodded in to double the lead. Stuttgart then found an unlikely route back into the game when Verhaegh felled Alexandru Maxim, allowing Ibisevic to reduce the arrears from the penalty spot. Stuttgart coach Bruno Labbadia replaced the ineffectual Moritz Leitner with Martin Harnik at the break, and it seemed to give the visitors a much-needed boost after their poor first-half showing. Arthur Boka’s volley was hooked clear on the goalline by the seemingly omnipresent Verhaegh, before Harnik’s flick was too strong for the onrushing Abdellaoue. Stuttgart were now well in the contest, even if Augsburg continued to construct, and then waste, openings on the counter-attack. The wind was then taken out of the away side's sails, however, after the referee showed a red card to substitute Ibrahima Traore for a reckless challenge on Ronny Philp, and suddenly Labbadia’s side had it all to do again. Despite their man advantage, Augsburg seemed incapable of scoring the third to kill the game off, with an inexplicable miss in front of a gaping goal from Sascha Mölders the pick of the chances spurned. The final few minutes resembled a basketball game as Stuttgart committed men forward leaving space for the home side to exploit, but 2-1 it remained. Augsburg now move up to 12th in the table, while VfB remain second-bottom.